Avery UK has announced the launch of several new product lines designed to meet increased demand. 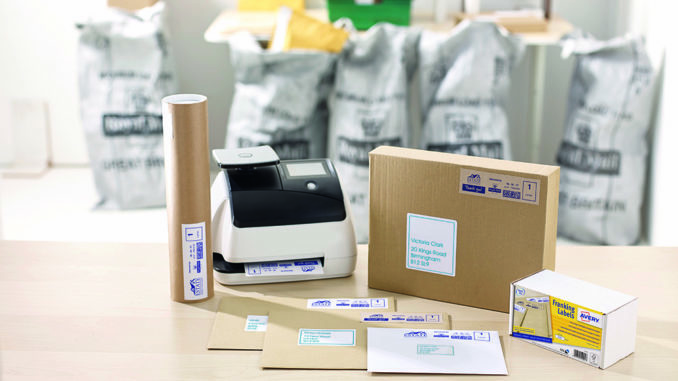 These include a range of franking labels, a contemporary desktop accessories range and a series of brand new A3 labels. Growth in the e-commerce market, which was reported to be worth £133bn last year, led Avery to develop its new range of franking labels. 3.5 billion parcels are sent annually in Europe and franking has now become cheaper and more convenient for businesses than stamps and other courier services. That’s before you’ve considered the professionalism and appearance of a franking label, where a company name and logo can often be added. As such, franking is proving popular in the UK to make brands stand out; recent Avery research found that an engaging label design can increase probability of a recipient perceiving the parcel’s contents as high quality by an enormous 564%. Its new franking range will cover the whole market of franking with a wide range of sizes compatible with all leading machines. There is also a choice of materials on offer, with brown franking labels made from 100% post-consumer waste and traditional white franking labels made from FSC certified paper. Avery’s A3 labels come at a time when A3 capabilities are at an all-time high, and research points towards consumer demand for smaller, more cost-effective packs of labels. In response, Avery is offering packs of 10. On top of this, Avery is expanding its desk accessories with the Brilliance range, while office accessories are predicted to grow 2.4% from £2.06bn in 2016 to £2.1bn in 2021. These three new launches form part of a whole wave of planned new product development and launches by Avery in 2018.